In June 2012 David Bean, from IDX, traveled to Indiana (USA) to complete the FOUNDATION CERTIFIED PROFESSIONAL qualification at Trine University and establish a framework to bring their certified courses to South Africa. David has subsequently applied to become a CERTIFIED FOUNDATION Instructor enabling him to run courses in South Africa. IDX will work with local vendors over the next few months to establish the necessary training laboratories while also finding out who is interested in receiving training. Part 1: Students register online and complete the necessary theory in their own time in the weeks prior to attending the course at IDX Academy. The online learning modules include a number of “open book” tests for submission. Part 2: Students come to the IDX Academy and spend four days doing detailed “hands on” work with Foundation Fieldbus – from making up cables to configuring an in the field PID loop with actual devices. 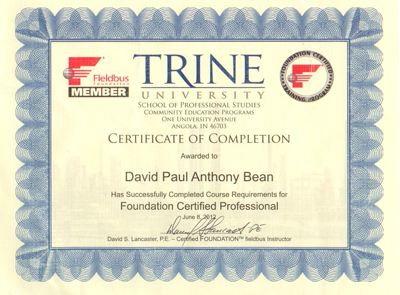 After successful completion of the course a CERTIFICATE OF COMPLETION will be issued by TRINE UNIVERSITY. Classes are limited to 8 students and will cost R25 000 (ex vat) per student. This same course in the USA will cost US $ 3950 (approximately R32 000 without taking travel and accommodation expenses into account).